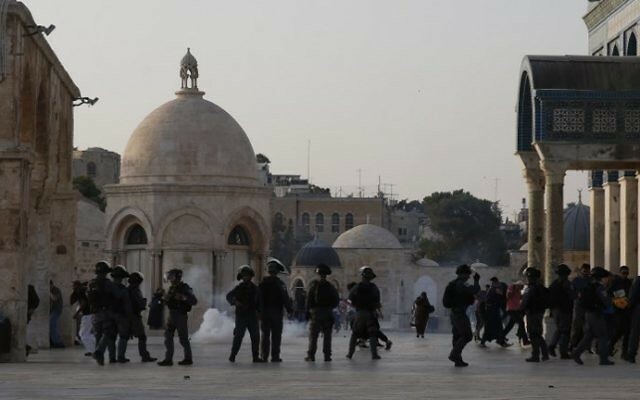 The decision was made by Jerusalem police chief Yoram Halevi after a security assessment, a police spokeswoman said early Friday morning, in anticipation of mass demonstrations after prayers — the highlight of the Muslim religious week — later in the day. The site remained open to all women. In addition, large numbers of forces were being deployed in and around Jerusalem, and some roads leading to the flash point holy site were closed to traffic. Police called on Muslim leaders and public figures to denounce incitement and violence and to act responsibly to calm the situation. 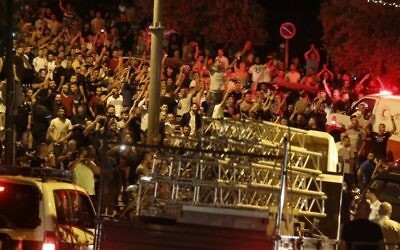 Extra police and border guard gendarmes were ordered deployed to Jerusalem hotspots, and the military was beefing up its presence in the West Bank, a week after heavy clashes in the capital and West Bank left five Palestinians dead and saw a Palestinian terrorist stab to death three Israelis at their Shabbat meal in a West Bank settlement. The army maintained a state of heightened alert on Friday, keeping additional battalions on call in the West Bank. In response to calls by some Palestinian leaders for protests around Israeli settlements, which have mostly been rescinded following the removal of the additional security measures at the Temple Mount, a military official said on Thursday that the IDF was prepared for any development in the field. Tensions persisted Thursday, even after Israel removed the last of a series of security measures erected at entrances to the Temple Mount, known to Muslims as Haram al-Sharif (Noble Sanctuary), following a July 14 terror attack in which assailants used guns smuggled into the compound to kill two policemen guarding near there. 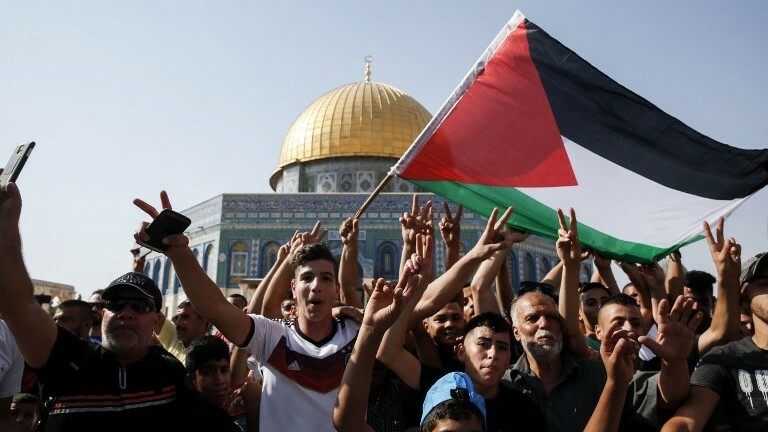 Palestinians had celebrated Thursday morning as Israel rolled back the security measures and thousands of worshipers heeded a call by Muslim authorities to assemble for prayers at the Al-Aqsa mosque for the first time after boycotting the site for 11 days. 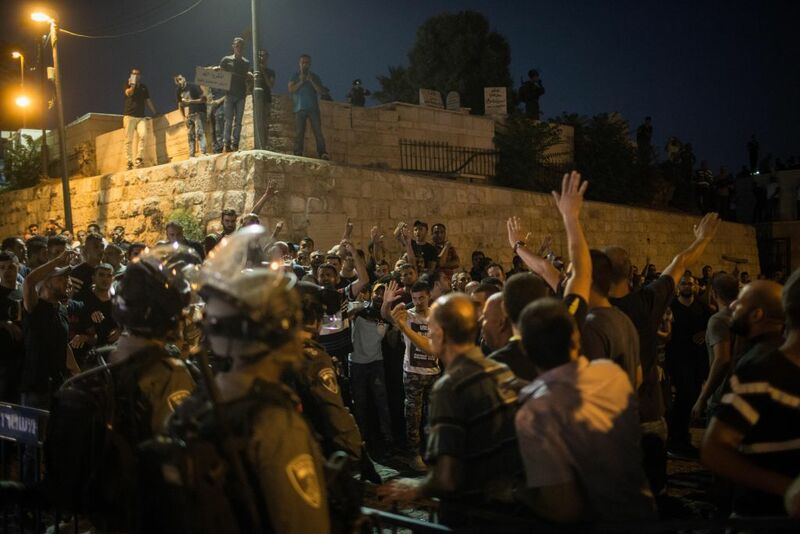 But as crowds pushed at one of the gates to the compound in the Old City, clashes erupted and police fired tear gas and rubber bullets to disperse them, with dozens reported wounded. 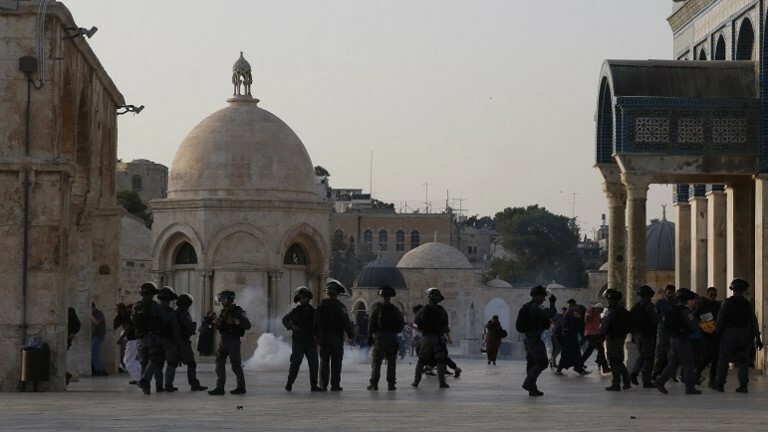 Clashes also broke out on the Mount, where activists attempted to fly the Palestinian flag from the mosque and threw rocks at Israeli forces, with some projectiles flying onto the Western Wall plaza below. Ten police officers were injured in the ensuing clashes, according to Israel’s Channel 2 news. Police confirmed one injury. 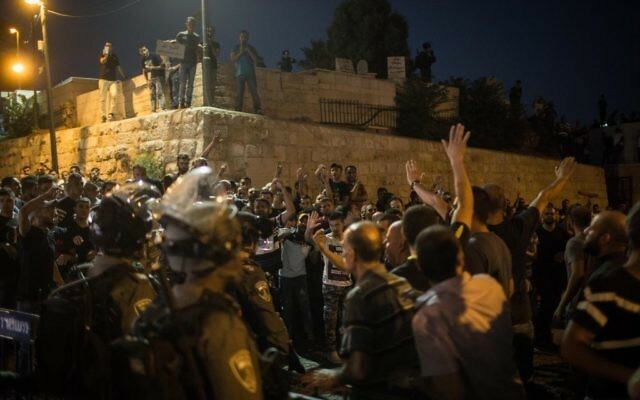 More clashes between Palestinians and Israeli security forces erupted after nightfall, with the Red Crescent saying at least eight people were hurt. Later Thursday night, police removed dozens of Palestinian youths who had barricaded themselves inside the mosque. Over 100 people were arrested and 15 were injured in the ensuing melee with police, according to Palestinian media. Police said they decided to storm the mosque and forcibly remove the protesters after several calls by both police and officials from the Waqf Islamic trust that administers the site failed to move them. A spokesperson said the decision was part of a bid to keep a lid on violence on Friday, the Muslim holy day. Israeli officials had been hoping a planned “day of rage” by both the Fatah and Hamas Palestinian factions would be called off after the security measures were removed, but said they were prepared for protests. On Wednesday, a youth group affiliated with Palestinian Authority President Mahmoud Abbas’s Fatah movement said it would attempt to “isolate settlements” by blocking West Bank roads. 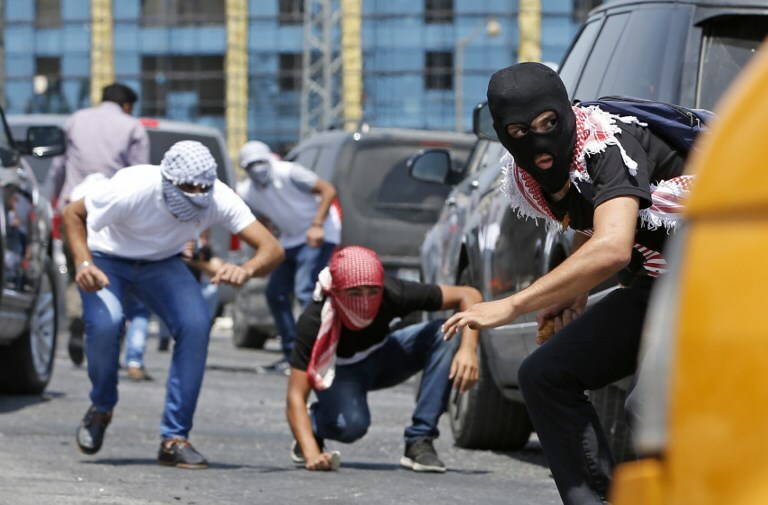 The Tanzim militia, which had been a key player in violence during the Second Intifada more than a decade ago, was invited by Palestinian officials to mobilize protests for Friday. 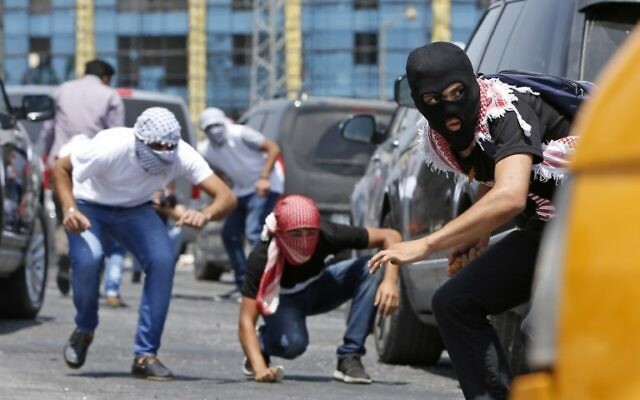 At the same time, the Hamas terror group held a “victory” parade in Gaza and urged violent protests in the West Bank. 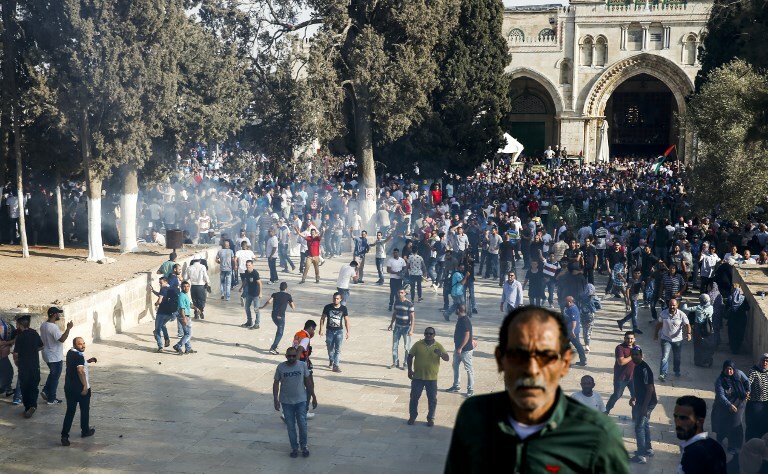 A week ago, with metal detectors still in place, clashes broke out in several Jerusalem neighborhoods and the West Bank after Muslims held large prayer protests at midday Friday. 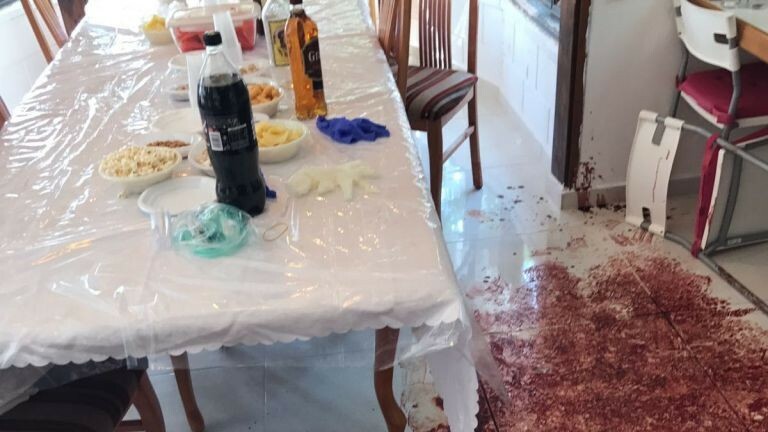 On Friday night, a Palestinian teen inspired by the fight over the Temple Mount sneaked into the settlement of Halamish, near Ramallah, and stabbed to death three members of the Salomon family celebrating Shabbat. 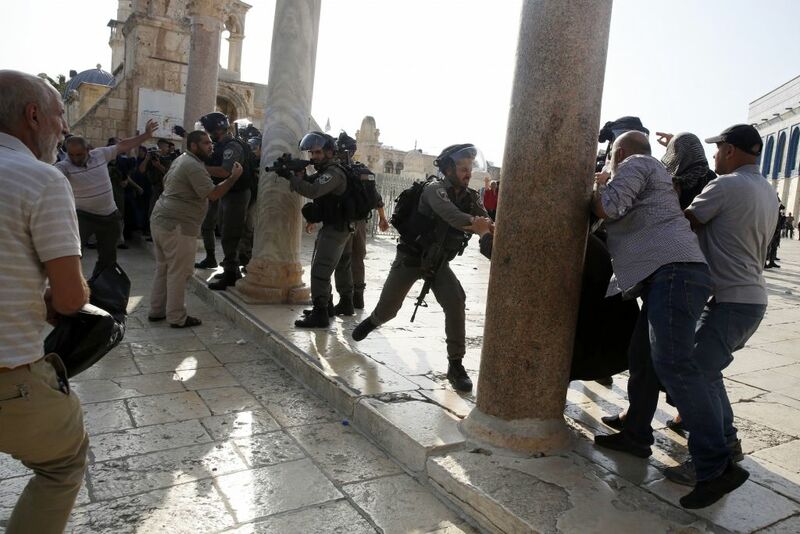 Daily protests had continued even after Israel removed the metal detectors on Tuesday. On Thursday, Mohammed Kanaan, a 26-year-old Palestinian who was wounded earlier this week outside Jerusalem in a confrontation with Israeli troops, died, said Dr. Ahmad Betawi, head of a West Bank hospital. 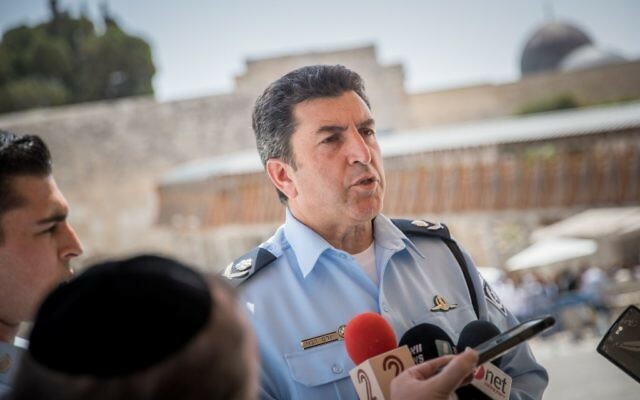 Speaking to reporters on Thursday shortly after the last security devices were removed, Halevi, the Jerusalem police chief, said authorities would do all they could to prevent further unrest but protesters “should not be surprised” if officers responded to disturbances with force. “No one should try to test us tomorrow,” he told reporters, promising calm if worshipers follow the instruction of their religious leaders to end the protests. But “if there are people who try tomorrow to disturb the peace, to harm police or citizens, they should not be surprised: There will be casualties and people injured,” he said, reiterating it two more times during the course of his public comments. “Don’t test us, because we know how to respond, and we know how to respond directly and forcefully,” Halevi added emphatically. 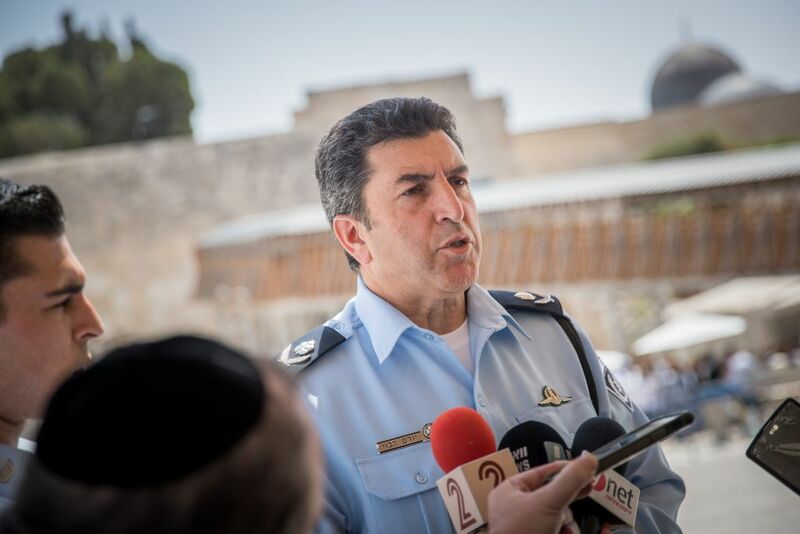 He said that while Friday prayers may see additional “victory celebrations,” Palestinians should keep in mind that police are still in charge of Temple Mount security. Despite the reduction in security measures, the police chief promised not to back down on checking worshipers entering the compound. “We will check anyone suspicious, anyone who we think could disturb the peace, anyone who could be an attacker. They will be stopped at the gate, they will be checked as we have done in the past,” Halevi said. 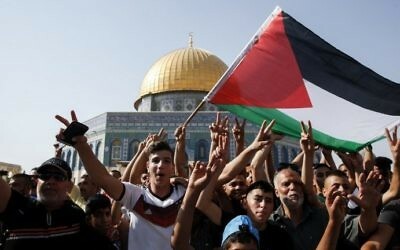 The fate of the Temple Mount is an emotional issue at the heart of the Israeli-Palestinian conflict. Even the smallest perceived change to delicate arrangements pertaining to the site sparks tensions. Jews revere the hilltop compound as the Temple Mount, site of the two Jewish biblical temples. It is the holiest site in Judaism, and the nearby Western Wall, a remnant of one of the temples, is the holiest place where Jews can pray. The walled compound is home to the Al-Aqsa Mosque and the Dome of the Rock. It is Islam’s third-holiest site after Mecca and Medina in Saudi Arabia. Muslims believe the site marks the spot where the Prophet Muhammad ascended to heaven. 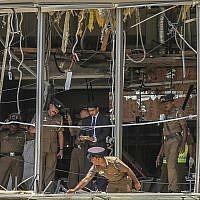 Israel had faced intense pressure over the security devices and said it plans to install sophisticated cameras instead. 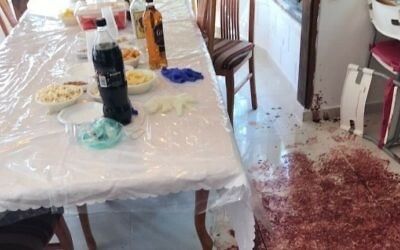 Palestinian leaders and Muslim clerics had insisted Israel restore the situation at the shrine to what it was before the attack.